He’s a player and she’s ready to play… but what happens when the fun gets serious? Joey is mortified to face Brent the next morning after letting the question slip in a weak moment. 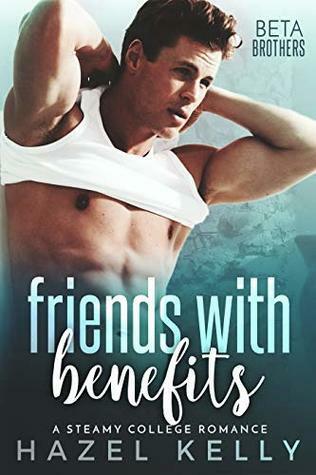 She’s shocked when Brent not only agrees but proposes a friends with benefits arrangement. How can she accept when it threatens what’s most important to her: her friendship with his sister, her new job with his football team, her self-respect when an ex-girlfriend is suddenly back in the picture – and her heart? After years of working hard to fulfill his responsibilities, Brent is finally enjoying his life – with women who want nothing more than a good time. But when Joey asks him to be her first lover, he can’t resist finally getting his hands on her luscious body, one he’d been lusting after for years. Only problem is, once isn’t enough. He’s not ready to give up his hard-earned freedom nor is he ready for a woman to invade his life – or his heart. When demons from his past come back to haunt him, will he let them ruin what he’s found with Joey? Source & Format: Author–eARC | Thanks so much Bella d’Amour! I’m a sucker for the “in love with BFF’s brother trope”. I just love all the delicious tension it brings when two people inevitabley fall for each other (if they aren’t secretly in love with the other person already). I wasn’t sure what the case was going to be here, but I was excited to dive into Free to Play. Don’t worry, there are plenty of steamy moments between the two of them. However, they had these great moments of conversation where they discussed their hopes and fears among other topics. I like seeing that emotional connection be established in my romances and this one succeeds beautifully. I love stories where the heroine learns to be confident in herself. Sometimes that’s hard to do in a romance because all too often, the heroine only become more independent by becoming dependent on the hero/their relationship. (I know that’s confusing but I hope you get what I am saying). And while Brent does help Joey build her self-esteem when it comes to her body image, I would say he is a vehicle for her start to see herself in a different light, not the sole reason. He helps her to see herself outside the stereotypes she’s boxed herself into and once that seed is planted, she learns to grow on her own. I loved that. This isn’t to say that Brent doesn’t have great character development. He too goes on a journey where he grows up and figures out what is truly important in his life and I liked that a lot. I get why certain things happened at the end. They help enhance the lessons of the novel and that’s great. But this novel felt so grounded for so long that I didn’t entirely enjoy all the (slightly) over the top drama that occurs. Again, I know why everything happens as it does, I just wish it didn’t. However, we have more than enough time to wrap everything up nicely so win! I’m super excited for the sequel! I loved Brent’s family and I hope they become the focus of the sequel novels. I already have a hypothesis of who the next book involves so I can’t wait to see if I’m right! I had my suspicions about who the leads for book 2 would be and I was not disappointed! Despite the quick initial spark with these two shared, I loved the slow burn of this romance. It gave the romance an edge of anticipation knowing that they had crossed the line but were holding back despite their every need not to. I loved watching these two get to know each other and breakdown those barriers that they had erected in the past to stop the pain of falling in love only to be hurt later. In this story, I think it’s our hero who gets more time to shine but that isn’t necessarily a bad thing. He definitely had the more convoluted history and I enjoyed the mystery of uncovering that past so he could move forward. I would have liked to have seen a little more from the heroine in terms of development, but I think she was a great compliment to our hero’s story. We get just a taste of what the future might hold in terms of possible sequels and I know that I’m definitely sticking around to see what will happen next! I was really excited for Stevie’s story and I’m a sucker for a solid second chance romance; so this was a great combination from the start! Bella d’Amour has this incredible talent for bringing characters to life. Her romances always have great tension and chemistry between the leads, but I’m always blown away by her ability to develop genuine, relateable characters. I feel like these characters could be my friends and I get super invested in their lives and journeys. Both leads have fantastic growth from start to finish–probably because they actually share what they are feeling with each other and communicate! It’s so refreshing to see in a romance. If you want a book that will tug on your heartstrings, pick this up! If you love character-strong romances, pick this series up!